While the consumer journey today doesn’t look a lot like a funnel, it’s still critical to plan your communications and activities in multiple stages. The major mistake you can make is to plan each phase in a silo, and not figure out how to design and analyze each phase? how they’re connected? and how the marketing channels impact each phase? Before highlighting the top strategies for managing the marketing funnel, let’s start with understanding the function of the marketing funnel. The marketing funnel is a tool that helps you visualize the online journey or the path a prospect takes throughout your campaigns, from an introduction (awareness) to a lead ( consideration ) to a client (conversion) and hopefully beyond (advocacy, loyalty or retention). Because there will always be prospects that exit your funnel without converting. The role of marketers is to increase the number of prospects that enter the top of the marketing funnel and decrease the percentage of prospects that exit each stage of the funnel. How does it work? The prospects either descends into the next stage of the funnel when their interest increases or they exit the funnel when they lose interest. Usually, fewer end up purchasing and even fewer turning into loyal clients (that’s why the funnel is wider at the top). Understanding the marketing funnel allows marketers to see where you are losing customers. Between each stage, the marketers can measure the percentage of drop-outs and indicate the gaps. 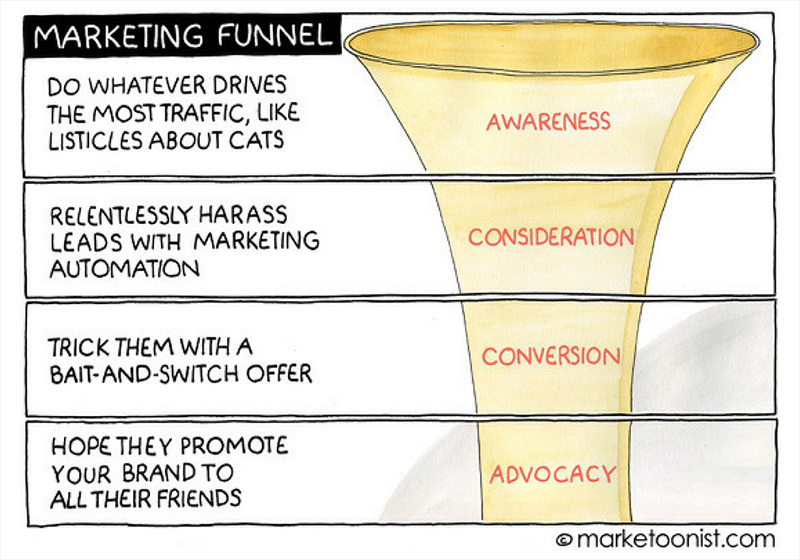 Implement growth hacking tactics by a using “widening the funnel” tactics. The quality of the marketing funnel is the main engine for cost efficiency and ROI. 1. Analyze the objectives of each stage: The key for each phase shouldn’t be to jump to the next one, it should be based on understanding the individual objective of each phase. Don’t stick to the main structure of the funnel and divided each stage into even smaller stages based on your consumer analysis and product. Adapt the funnel phases accordingly and you may end up having 6 or 7. If standard funnels worked for every product and consumer base, marketers would be out of a job. 2. Set KPIs for each stage of your marketing funnel: Have a conversion strategy for each stage of your marketing funnel. It is a mistake if you only monitor only the value of conversion at the lower funnel. The key to improving any marketing funnel is to establish key metrics for each phase to measure effectiveness. Obsess over drop-offs, they’re the biggest indicator of the ineffectiveness of the communications in a phase. 3. Pay attention to the middle funnel: It is a critical mistake when CMOs sometimes doesn’t pay attention to the middle funnel (Consideration). The middle funnel is the key to improve the lower funnel rates. Strategically, improving the quality of middle funnel can maintain a less expensive budget for the upper funnel. Invest in conversion optimization, A/B testing, personalization and lead nurturing is the most effective approach to fix your big gap between the higher funnel and lower funnel. 4. Build a meaningful journey, not phases: Take your customer on a journey that they would like to go through. Marketers are sometimes planning their journey as phases or basic stages without a connection. Don’t imagine that your clients will follow your logic, they would need something meaningful to through instead of making them jump from phase to phase. 5. The objective of each phase needs to be consumer-focused. Not brand-focused: The journey is about your consumer, and you’re a part of it. Let the consumer drive through your funnel smoothly and organically. Avoid being an advertiser all the time and sales oriented. The more value you add to them, the more enhanced your funnel is. 6. Different channels play different roles in each stage: Understand the impact of each marketing channels on each stage of your funnel. For instance, content marketing or organic can have a lower impact on upper funnel but play an effective role on the middle funnel. Connect the dots between the marketing channels and your funnel and empower your strategy with better tactics for acquisition. 7. 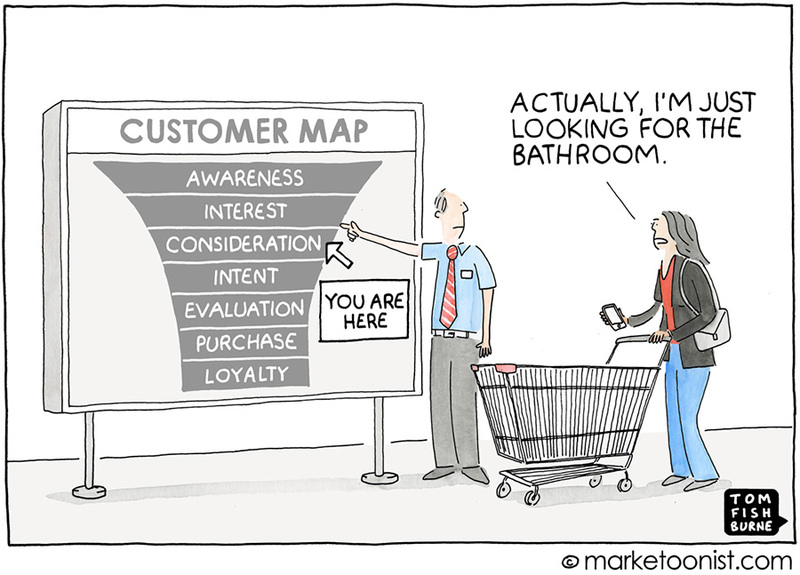 Let the funnel grow and mature: Don’t rush into building insights so quickly. Give your funnel the proper time span to be able to analyze accurately. With every change in your marketing activities and channels, the impact on funnel wouldn’t come the next morning. You’ll need to be wise with monitoring the funnel changes and wait for consumer impact over time. The bigger your consumer base the longer it takes to see the changes in the funnel. Share your experience with improving the market funnel tactics or let me know your feedback.